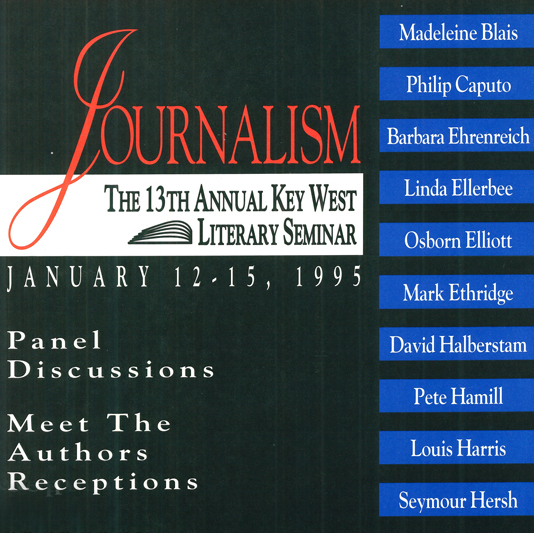 Coverage of the 1995 Seminar: "Journalism"
Presenters: Madeline Blais, Philip Caputo, Barbara Ehrenreich, Linda Ellerbee, Osborn Elliott, Mark Foster Ethridge III, Fred Friendly, David Halberstam, Pete Hamill, Louis Harris, Seymore Hersh, David Lawrence Jr., John Naisbitt, Jane O’Reilly, Anna Quindlen, and Brent Staples. Writers’ Workshop Faculty: Madeleine Blais, Jane O’Reilly and Mary Lee Settle. (L-R) Osborn Elliott, Linda Ellerbee, Pete Hamill, Anna Quindlen, and Seymour Hersh during their panel, "Does the Press Have Gritt? "at the 12th Annual KWLS for Journalism in 1995. Photo by Richard Watherwax. (L-R) Osborn Elliott, Linda Ellerbee, Pete Hamill, Anna Quindlen, and Seymour Hersh during their panel, "Does the Press Have Gritt?". Photo by Richard Watherwax. A guided literary walking tour during the KWLS. Photo by Richard Watherwax. Authors Linda Ellerbee and Anna Quindlen signing books at the San Carlos Institute. Photo by Richard Watherwax. President of the San Carlos Institute Rafael Peñalver, Osborn Elliott and KWLS Executive Director Monica Haskell. Photo by Richard Watherwax. KWLS Executive Director Monica Haskell with KWLS board member David Ethridge. Photo by Richard Watherwax. Does the Press Have Grit?